"Italy has been made; now we need to make the Italians," goes a familiar Italian saying. Mussolini was the first head of state to include women in this mandate. How the fascist dictatorship defined the place of women in modern Italy and how women experienced the Duce's rule are the subjects of Victoria de Grazia's new work. De Grazia draws on an array of sources—memoirs and novels, the images, songs, and events of mass culture, as well as government statistics and archival reports. She offers a broad yet detailed characterization of Italian women's ambiguous and ambivalent experience of a regime that promised modernity, yet denied women emancipation. Always attentive to the great diversity among women and careful to distinguish fascist rhetoric from the practices that really shaped daily existence, the author moves with ease from the public discourse about femininity to the images of women in propaganda and commercial culture. She analyzes fascist attempts to organize women and the ways in which Mussolini's intentions were received by women as social actors. The first study of women's experience under Italian fascism, this is also a history of the making of contemporary Italian society. 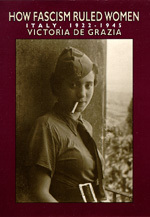 Victoria de Grazia is Professor of History, Columbia University, and the author of The Culture of Consent: Mass Organization of Leisure in Fascist Italy (1981).